A US scientist has discovered a new species of sea slug in a Californian state park. Jeff Goddard of University College Santa Barbara found the new species at Carpinteria Reef. It is a species of nudibranch - a group of brightly coloured sea slugs. After observing the creature back in the lab for a few days he had it identified by a leading authority on the taxonomy of sea slugs, Terrence Gosliner who confirmed it was a new species and named it after it's discoverer. Flabeliina goddardi was fully described in the September 15th edition of the Proceedings of the California Academy of Sciences. Goddard said: "it was pretty exciting to find a new species right under our noses...Only one specimen was found, so now we need to find out where more are hiding, what they feed on, and whom they interact with." The creature measures about 3 cm long when stretched out and crawling. In the published article, Goslinger writes: "Flabellina goddardi is named for friend and colleague Jeff Goddard who found the only specimen of this distinctive species. 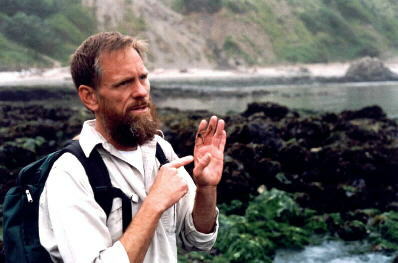 Jeff is the consummate naturalist with superb powers of observation."